The city of Corvallis has three Enterprise Zones that offer incentives and economic advantages to business locating in Corvallis, Oregon. 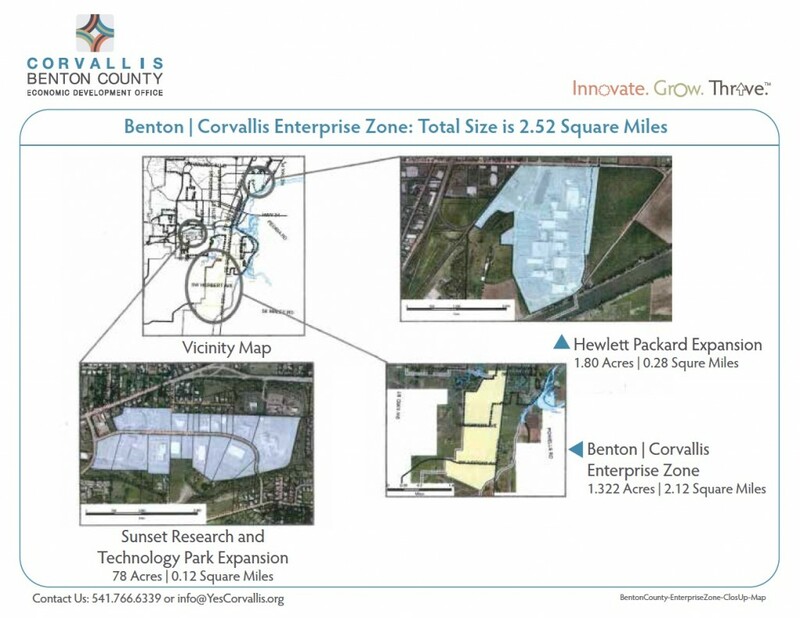 The City of Corvallis has three Enterprise Zones: South Corvallis, Sunset Research Park, and the Hewlett-Packard campus, targeting manufacturing and industrial businesses. ss might build or install in the enterprise zone. Also, an enterprise zone exemption is temporary, usually lasting only three years, after which the property induced by these incentives is available for assessment. An extension to four or five years in total is possible in some cases. For rather exceptional investments, longer-term incentives might be available in a rural enterprise zone, but only if Benton County meets certain economic criteria; these longer-term incentives also may include a state tax credit, which triggers annual payments to local taxing districts by the state government. Both the extension and the long-term incentives need approval from the City of Corvallis and Benton County, which sponsor the Benton/Corvallis Enterprise Zone. Finally, none of these property tax exemptions would be available to just any business. Most commercial or retail operations would not be eligible. Rather, the primary beneficiaries of enterprise zone benefits are manufacturing or other more-industrially oriented facilities serving other businesses. For more information about the Enterprise Zone, please contact Economic Development Manager Tom Nelson at 541-766-6339.